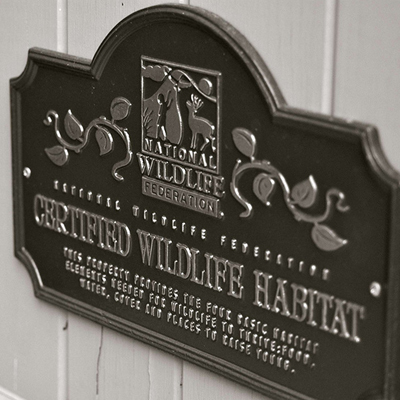 Our office is located at a certified wildlife habitat. Let's explore and see some of the unique qualities that this "enhanced" property, which once was a dairy farm, has to offer as a model. Today, it is in the process of reclaiming itself with the help of plantings that will benefit a wide variety of wildlife. Take a few moments to relax, enjoy the tranquil setting, and observe the natural wonders found here. The wildflower plantings along the driveway have taken the place of mowing. This reduces the amount of resources needed to maintain the area. With a lawn, people have the tendency to want it to look it's best, so they use lots of water, as well as pesticides and herbicides to make it "perfect". These additions destroy the plants and animals, which naturally exist and interrupt the natural cycle. The roadside wildflowers provide homes and food for many insects, mammals and birds. Sparrows and dark-eyed juncos feed on their seeds. Provide high nectar content and landing platform for butterflies. Many birds eat the seeds. The black swallowtail butterfly lays eggs on this plant and it provides the larva or caterpillar with a food source. The down of the seeds are used as a liner in goldfinch nests and the seeds provide a food source for many birds. The berries are eaten by grouse, pheasants, quail, bluebirds, cardinals, catbirds, flickers, and woodpeckers, to name a few. Rabbits eat the Sumac's bark and fruit. Chipmunks eat the berries. Deer will browse twigs and foliage. The grasses provide forage for plant eating animals like whitetail deer, cottontail rabbits, woodchuck, and voles. These grasses also provide nesting cover for grassland birds, like the meadowlark. Red fox, red-tailed hawks, coyotes and skunk utilize these areas for hunting sites. Around the perimeter of the property you will notice that evergreens have been planted. The arrangement of plants is an important element in natural landscape design. The evergreens planted on the north and west side will protect the building from winter winds, and they also provide shelter in the winter and nesting areas in the summer for birds. Their sap, needles, and twigs are eaten by wildlife. Eastern White Pines are used by 48 species of birds. The yellow-bellied sapsucker eats the sap and the insects attracted to the sap pits. The junipers you may have noticed in the parking lot provide nesting areas and berries for many birds, and deer will browse on their needles. Junipers, with their pointed needles, provide valuable protection for birds. The building is located so as to best take advantage of the shade from the mature oak and hickory trees. Deciduous trees provide an excellent way to cool down the building in the summer and to facilitate sunlight in the winter to the same area. This is a good example of energy conservation. The oak-hickory forest is a community that provides for many of wildlife's needs: Food, shelter, and space. Oaks provide significant food for many animals. Nuts and acorns, collectively called "masts," are the main fall and winter food for white-tail deer, fox and red squirrel, ruffed grouse, mallard ducks, wood ducks, raccoons and blue jays. The understory of shrubs and vines provides food and nesting cover from June through August. The berries from the understory attract birds such as the brown thrasher, blue jay, gray catbird, American robin, eastern bluebird, cedar waxwing, northern cardinal, indigo bunting, and many more. Many butterflies are attracted to the flowers of these trees and shrubs for nectar. Oaks retain their dead brown leaves throughout much of the winter making them useful for wildlife cover. Many birds use their twigs and leaves as nesting material. Shagbark hickory nuts provide food for fox, gray and red squirrels, as well as chipmunks. The hickory tree can live to be 250 years old, making them, like the oaks, a great long-term wildlife investment. Both of these trees provide cavities for nesting, which are used by 96 species of wildlife. Brush piles of branches and twigs from various plants have been developed on the property to provide shelter from weather, predators, nesting sites, in addition to den sites, for woodchuck, cotton tail rabbits, garter snakes, red fox and many other species. Piles placed in the water can provide roosting spots for birds and some amphibians as well as provide shelter for frogs and turtles. The wetlands on the property are some of the richest habitats found on earth. They provide for a wide variety of animals, from birds, to small mammals, reptiles, amphibians and insects. A wide diversity of plant life lives in all levels of the pond. Wetlands capture eroding soil from surrounding areas as run-off. They can cleanse run-off water of any fertilizers or pesticides that may enter the wetland. The ponds on the property provide for water, something many people forget to provide in their backyards for birds in the winter. An aeration system has been installed in the ponds to provide open water year-round and also to maintain appropriate oxygen levels for fish, frogs and other organisms. Providing this water on your property can be as simple as a dripping source for birdbaths or puddles for butterflies. Plants found in or on the wetland edge provide food and shelter for a wide variety of creatures. Animals like snakes and frogs use water lilies as shelter. Muskrats will eat various parts of water lilies. Cattails provide food for over 17 species of animals; Canada geese eat roots and seed, and ducks will use the cattails as cover. Pickerelweed, with its purple flowers, has seeds that are eaten by wood ducks and muskrats. Look for them on rocks or branches basking in the sun, collecting solar heat! Shelter: Cattail leaves piled in a mound or digging into the banks. Look for their homes made of cattails or watch for them as they swim on top of the water! Food: Insects that live over the pond—flies, bees, dragonflies, mosquitoes. Shelter: Cavities found in trees near the water or nesting boxes. Watch for them as they skim the water surface and collect insects! Shelter: In or on banks of water uses aquatic plants as shelter, lays eggs in jelly mass in water. Listen for their spring call of constant---peep, peep, peep! Food: Aquatic insects and insects which fly near water surface. Listen for their call, which sounds like banjo strings or look for them on the surface camouflaged in duckweed or algae! Food: Some snails, crustaceans, worms, and beetles. Shelter: Makes nests of and among cattail plants. Watch for the male as he roosts on top of the cattails and listen for his distinct call..........ookayeee, ookayee! Food: As aquatic nymph, eats insects even small fish and tadpoles; as adult, eats insects on or near the water surface. Look for them skimming the waters' surface or among the cattails in pursuit of other flying insects! The courtyard is designed to meet the needs of wildlife. Can you find any plants that would provide for butterflies, birds or small mammals? The design of this area gives one a good idea of the important elements needed for wildlife habitat improvement. Evergreen trees and shrubs provide wind protection for butterflies which visit the flowers, protection for birds who come to feed, and also buffer the sights and sounds from the nearby roads. Seeds or berries provide food for mice and birds. Twigs and buds may be eaten by deer in the winter. Nectar flowers such as columbine, yellow lilies, and clematis vine provide nectar for a wide variety of butterfly species. Rocks provide landing pads and sun-basking areas for butterflies. The rocks give escape areas for small mammals and insects. Grasses provide a source of seeds for many birds, mice and voles. Many butterfly caterpillars depend on grasses for their main food. Hummingbird feeders attract hummingbirds to the area for viewing. These feeders assist hummingbirds in the spring in gaining energy for their long flight north, and in the fall for their flight south. Bird feeders attract seed-eating birds to areas where you can view their courtship and feeding behaviors. In severe weather, such as an ice storm, feeders help birds to obtain food. Only approximately 30% of a bird's food would come from a feeder. The natural plants of grasses and seed bearing plants give them their main food source. Take a few moments to view the area and relax. Take in the sights and sounds. This could be your backyard or business. Think of all you could provide for wildlife, with less time and energy wasted on the pursuits of a "perfect lawn." If one were to imagine what this property once looked like as a dairy farm, it is hard to believe that today one would find such a wide variety of plants and animals living here. Through careful planning and enhancement of the natural landscape, this property has become more diverse and exhibits sound wildlife habitat improvement and protection. Birdscaping Your Garden: A Practical Guide to Backyard Birds and Plants That Attract Them, George Adams, Rodale Press, Inc.
– This text was prepared by the Kalamazoo Nature Center.